One of the best parts about having kids is celebrating each and every family member’s new place in the family tree. The Family Tree Bib by perennial etsy favorite Sewn Natural takes that idea to heart with a personalized baby bib that makes a great baby shower gift for hipster families or anyone with a love of nature nostalgia. Featuring hand-embroidered initials on a realistic-looking woodgrain pattern, the bib is made of a soft and plush organic flannel cotton and includes a velcro close that’s gentle on baby’s neck. Handmade in a Canadian studio that’s pet and nut-free, this bib will undoubtedly become a sweet family keepsake and a reminder of the simple pleasures of growing a family. One of the best parts about having kids is celebrating each and every family member's new place in the family tree. The Family Tree Bib by perennial etsy favorite Sewn Natural�takes that idea to heart with a personalized baby bib that makes a�great baby shower gift for hipster families or anyone with a love of nature nostalgia. 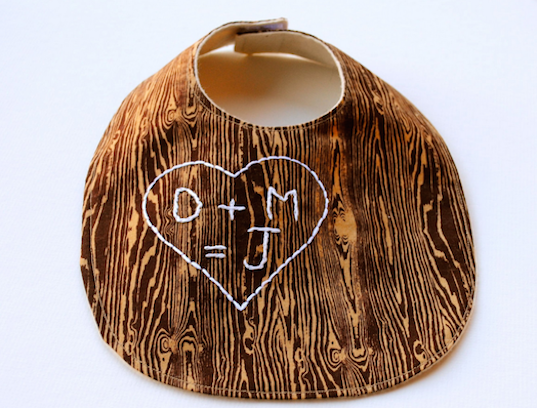 Featuring hand-embroidered initials on a realistic-looking woodgrain pattern, the bib is made of a soft and plush organic flannel cotton and includes a velcro close that's gentle on baby's neck. Handmade in a Canadian studio that's pet and nut-free, this bib will undoubtedly become a sweet family keepsake and a reminder of the simple pleasures of growing a family.